These days I love tile projects that are meditative and don’t ask too much of me creatively. This might sound counterintuitive since I'm an artist and after all isn't creativity my thing? Yes, yes absolutely, but for the past 3 months or so I just haven’t had much creativity to give. I’ve been in a shedding skin time and have needed all my creativity for my own life. Tile commissions require that I dig into my heart and use my artistic eye and to hand create a piece for someone else and this process entails a whole lot of giving of my creative life force. Don’t get me wrong, I love commissions, really love them. A meaningful mutually appreciative relationship with the client enables me to give of myself so readily! Being commissioned to put my love of life, of nature, of making into something beautiful that will bring joy for generations is an honor and I live for it. But for now my innovation, aesthetic curiosity and technical prowess are recalibrating and shifting while I find new and richer ways to give of myself. I’m feeling around for a creative evolution in my work that fires me up more. I’ve needed to step back to heal some old wounds and go deep to find new rivers of energy within myself to live and work from. Meanwhile I still need to make a living so, when this Firebox Tile order for a Los Angeles designer arrived in November I jumped up and down “yes, yes yes” knowing it would enable me to make some money doing something I find meditative and enjoyable but still leave my creative energy in restoration mode. A great blessing to say the least. 3” squares of Sage Green glazed Firebox Tiles. What are Firebox Tiles? 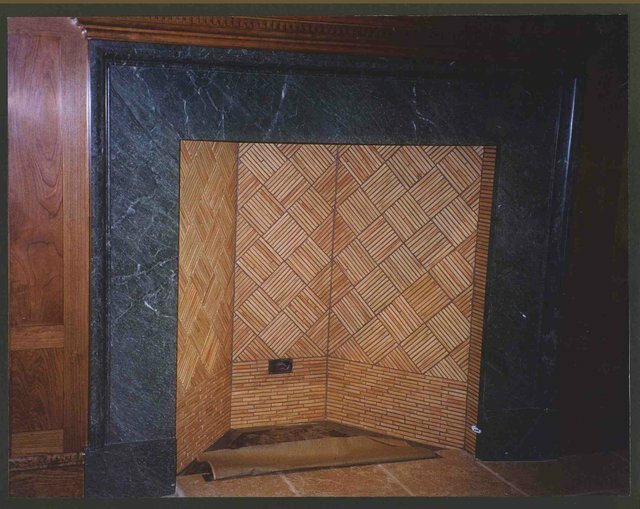 Fireproof tiles that can be used to line the inside of a fireplace. But why do you need Firebox Tiles, can’t regular tiles be used in a fireplace? Nope. Tiles do well with heat if temps are evenly and slowly increased as in a kiln but not with the extreme nor sudden changes in heat in a fireplace. Think of a stovetop, if you were to put your ceramic mug on the burner and turned it up high to reheat your coffee, the bottom of the cup next to the heat will separate from the rest of the cup as the temperature quickly rises at the base while the top remains cooler. And stovetop temperatures are only a few hundred degrees while fireplace temperatures can go from 70 to a 900 deg F within 30 minutes. Thus I developed a special clay body that has the refractory qualities needed for these conditions. In 1999 thanks to my father’s idea, I created a refractory ceramic tile and spent years testing it and then patented it. As of now, I believe mine is still the only product of its kind in the world and you can see more of it at www.fireboxtile.com or in this previous post. Once the 23 square feet of tile were made, I drew a template and placed the 3” tiles together in sheets using a face adhesive to hold them in place for easy installation by a tile setter. Here are the tiles before I began carefully packing them up into 4 boxes to ship. That is a beautiful glaze, a lovely range of green hues. thank you so much @opheliafu! Aaahhh I almost forgot to comment this one ^^. But I am very happy that you found a project that is not too taxing artistically, after all it is pretty normal that our inspiration and artistic well get dry from time to time. You put so much thought and careful consideration, it really shows your dedication to your art. If only everyone is more like you, unfortunately this is not the case. I've seen good ceramic art get botched because the installer put in the wrong tile ^^;. Be well and be happy :). The installer certainly CAN botch things - I saw a project once where the installer put the tiles up backwards so the back of the tile was facing out and the glazed side was against the wall. Such a crazy mistake! Beautiful! I can understand why the ancient Romans covered their interiors with tile. thanks @stef1, love to see photos of your fireplace tile! That is so amazing and cool that you developed your own firebox tiles. I can imagine how exciting it would be to NOT use them. Yikes. Stuff flying off the fire walls at light speed. Sounds like you are going through a very interesting 'journey' in the creative realm involving self. Hope that continues and has a marvelous outcome. I suppose one does need to 'recalibrate' now and then. Reminds me of teaching, the constant 'give' can take everything you have. (And why I gave it up, and went back to the woods, years ago). And OH how I miss the Cardinals. I only get to see them when traveling to Arkansas and other Eastern reaches, when visiting family. They are such a classic bird. Have a nice night. Hahaha, yes pieces of non-fireproof tile could indeed pop off the walls of the fireplace! Hadn't ever quite imagined it quite as I did while reading your comment. Yes I completely understand what you're saying about teaching taking everything you have, I felt that way about it too. Creativity has flowed abundantly and easily for me for many years now so it's ok with me to step back a little. In fact I'm liking the gentle existence for awhile! And the good news is that now I am actually starting to feel something stirring in me again and a desire to make stuff. I wish I had a potter's wheel still and have been craving making vessels and sitting behind whirring clay but they are very expensive. Wish I hadn't sold mine, but hmmmm....maybe I'll do a steemit fundraiser to get one!! So where are you from originally @ddschteinn? And when did you give up teaching and what did you teach and to whom? Yes I think sometimes it is cool to be pushed and challeneged, yet there are times when coasting for a bit is ideal. Great post! Firstly WOW you created and hold the patent on that! Amazing. I'd say that level of creativity and ingenuity gives you a 'free ride' ticket for the rest of life. You can ride on those laurels and just consider all your other work as icing on the cake! Well done you. I LOVE tiled fireplaces! 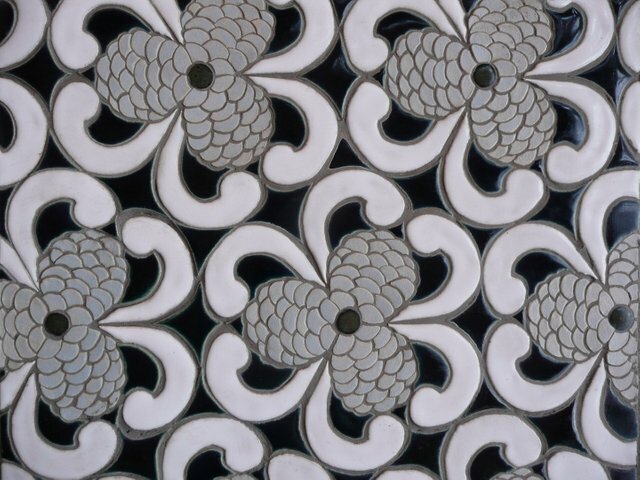 I love ceramics and tiles in general. Some of my favourites are the Pewabic tiles of Michigan. The tiles were and are so beautiful and the movement was pretty cool. My grandparents used to own an amazing house in Detroit back before the riots in the 60's and only sold that place shortly thereafter, but they had fireplaces with such tiles in and they are so striking! Well, as you know, I'm sort of in a forced meditative state with my own creation having to give up part of my day to things outside my own normal studio time. Yet, it is all life and change is part of that. With that change and rumination we can either embrace the inevitability of it or feel controlled by it. I know we are smart enough to see it as a learning time and know that with the change will come a new greater way of being and creating at the other end of it. Also, not sure your age, but there is that 7 year system we are all meant to feel. If you are at the beginning or end of that 7 year, that also is sometimes telling. Very interesting that your b&w drawings feel this way! I agree with your insights about times of change and the natural flow of rumination. "I'd say that level of creativity and ingenuity gives you a 'free ride' ticket for the rest of life." I haven't ever really considered these tiles much of an accomplishment but now I'm going to reconsider that stance!! I too LOVE tiles and can get excited even about the most simple tiles with beautiful glazes and Pewabic pottery certainly made so many gorgeous and timeless tiles, they are worthy of praise.